The Owl D3-14 Wide Gel System offers a simple, convenient and fast method for screening multiple samples on a single agarose gel. Ideal for screening PCR samples, plasmid preps, restriction mapping and cloning. 25 to 200 samples can be run simultaneously on one gel; producing clear, tight banding patterns with no -smiling-. Ships complete with Buffer Chamber, SuperSafe Lid with Attached Power Supply Leads, EasyCast Gasketed U.V. 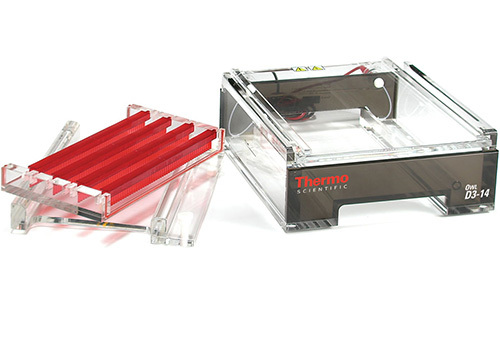 Transmissible (UVT) Gel Tray, External Gel Caster, Bubble Level, 4 Combs: 50 Well, 1.5 mm Thick. Part Number D3-CST-14. Please note that trays are not included.